Nippon Mektron, Ltd. began in November 1969 in Kukizaki Village (now Tsukuba City), Ibaraki Prefecture, as the flexible printed circuit board (FPC) manufacturing subsidiary of NOK Corporation. Since its inception, Nippon Mektron has expanded its business under management with respect for others, based the NOK Group’s corporate philosophy of “Compassion and Trust”. We have grown to become the world’s leading FPC manufacturer. Under the global brand “Mektec”, we now provide FPCs to customers worldwide from our manufacturing and sales sites in every land. From production of materials to FPC modules equipped with a variety of functional components, we’re building systems that can respond flexibly to the diverse needs of our customers. The miniaturization and diversification of electronic devices is expected to increase ever further, as is the speed at which the Electronic Society will advance. 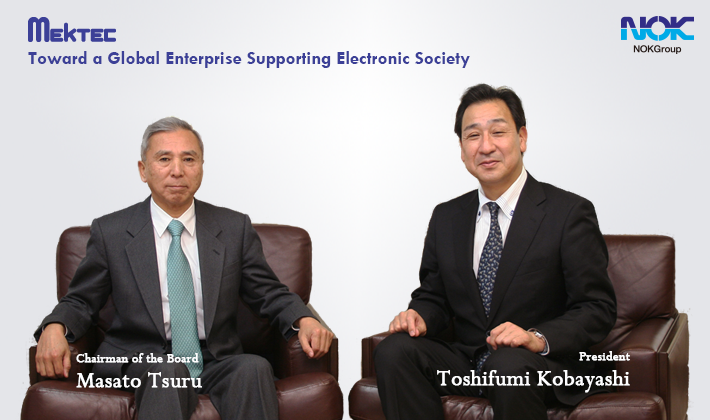 As we strive for rigorous quality control and unending technological innovation, we aim to fulfill our corporate social responsibility and make Nippon Mektron “a Global Enterprise Supporting Electronic Society”. We will endeavor to become a company in which all stakeholders in the Mektec Group can entrust their dreams, hopes, and pride.